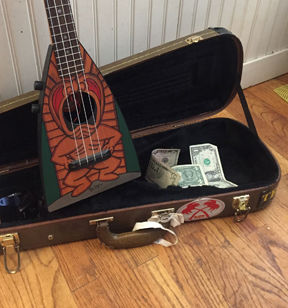 A plastic Ukulele created by George A. Finder and developed by Nino Marcelli. FIN-DER Inc. was based In San Diego Circa 1950's. Often (and originally) found with "Beach Boy" colored strings. The Strings were listed as "Flower colored", in "Red Hibiscus","Blue Iris","Green Fern", and "Orange Ginger". The intent was that the colored strings combined with an included instruction booklet would help you "Find" chords easier.